For the first time, scientists have used light beams to manipulate lipid rafts in artificial cell membranes. Lipid rafts are domains, or areas, of protein and lipid (fats) which float freely in cell membranes – the protein and lipid layer that surrounds a cell. These structures, which float in the membranes like icebergs, play important but mysterious roles in cellular signalling that aren't yet fully explained. However until now, our ability to study them has been limited – largely because we haven't been able to move or manipulate them. New research from Imperial College London has now demonstrated that optical tweezers, the laser-based technology that won 2018's Nobel Prize in Physics, can move, melt, scatter, and crystalise artificially-made lipid rafts when beamed at artificial cell membranes. These artificial rafts were created to mimic the lipid rafts in biological cell membranes. The authors say their findings could help improve our understanding of the role of lipid rafts in key biological processes like communication and their link to disease. Lead author Dr Yuval Elani, of Imperial's Department of Chemistry, said: "These light tweezers have illuminated a new path of research. Now we have the power to manipulate lipid rafts, we can discover so much more." The research is published in Nature Communications Chemistry. To carry out the study, the researchers created artificial cell membranes containing lipid rafts on glass slides. Under a microscope, they shone optical tweezer lasers at the membranes. Dr Elani said: "We altered the laser's power to deliver different levels of heat of the system, and could melt domains which had different melting temperature due to their different lipid composition. This is a quick and easy way to determine the melting temperature of domains." Dr Elani added: "Optical tweezers have previously been used to study a host of cellular processes – from the folding of proteins, to the action of ribosomes and manipulating whole cells. Our technologies pave the way for a deep understanding of the underlying biophysics of lipid rafts and domains, and of their biological significance." Co-author Professor Oscar Ces, also from Imperial's Department of Chemistry, said: "In 2018, Arthur Ashkin won the Nobel Prize in Physics for using optical tweezers to grab particles, atoms, molecules, and living cells with their laser beam 'fingers'. Now we have discovered yet more functions of these fascinating light beams." The authors say they will need to develop new hardware to gain deeper insights into how lipid rafts affect disease, but first, they will apply the technique to biological membranes – ones that aren't manmade. They hope their next stage of research will further improve our understanding of these mysterious lipid rafts. 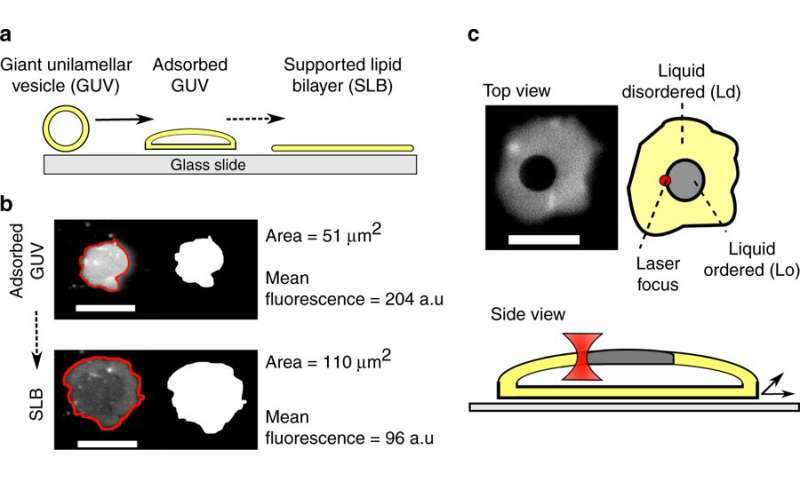 "Direct manipulation of liquid ordered lipid membrane domains using optical traps" by Mark S. Friddin, Guido Bolognesi, Ali Salehi-Reyhani, Oscar Ces, & Yuval Elani. Published 29 January 2019 in Nature Communications Chemistry. Ketamine acts fast to treat depression and its effects last—but how?